The United Nations General Assembly opened its 73rd session this year with a massive downpour in New York City. Flood-waters licked at the edge of the city, as world leaders gathered inside the 18 acres of land on the Turtle Bay area of Manhattan island. U.S. President Donald Trump–as usual–stole all the headlines. His speech at the UN and his comments in the corridors caused a few hearts to flutter. Trump spoke in his typical cryptic hyperbole, at once making all kinds of direct statements and then couching his attacks in a tone of abjection and resentment. When he said he was the greatest U.S. president, the delegates in the General Assembly hall burst into laughter (my report on Trump’s speech can be read at Salon). It is this kind of reaction that Trump resents. He demands to be taken seriously; his sneer and his bluster pointed at his current adversaries–China, Iran and Venezuela. He wants to go to war with the world to earn its respect. 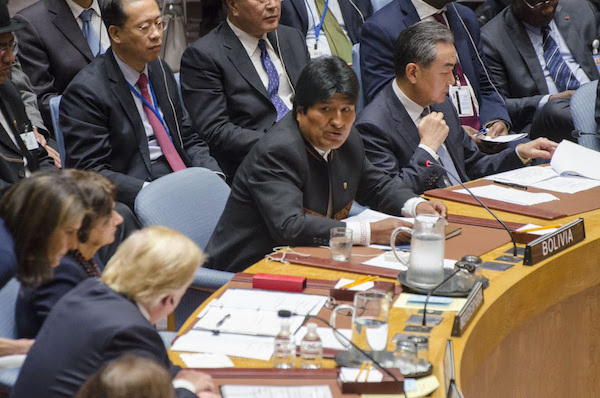 Sitting beside Trump at the UN Security Council was Bolivia’s Evo Morales. Trump feigned boredom as Morales laid out the history of U.S. interventionism from Guatemala and Iran to the present. It has become a cliché in the West to call Venezuela’s President Nicolas Maduro a dictator. Maduro, a former bus driver, and Hugo Chavez, a former soldier, come from the working-class of Venezuela. Such social mobility seems closed off in the United States. The United States, Morales suggested, is the real dictatorship, with its tentacles reaching from one end of the planet to another. ‘In recent months’, Morales said, ‘the United States has demonstrated its contempt for international law and multilateralism. It constantly invades countries and launches missiles. The U.S. is not interested in justice or democracy’. Morales’ indictment was sharp. In the picture above, Morales and Trump lock eyes. It was a moment of electric energy. Trump had bizarrely referred to the Monroe Doctrine of 1823 to justify the U.S. claim on the totality of the hemisphere of the Americas. It was on this basis that he openly gloated about military action against Venezuela. The consequence of such a war does not seem to rattle Trump. The consequences of regime change in Venezuela, a policy actively perused by the U.S. government (as I show in Frontline), bothers him less. Even those Latin American countries that are in the Lima Group–set up to overthrow the Venezuelan government–have no appetite for a military action. They know that their entire region will be turned upside down if the U.S. bombers began to conduct bombing runs on Venezuela. Venezuela’s Maduro has not been to the United Nations since 2015. It is his right to have come and address the General Assembly each year. But, pressure from the United States had made it difficult. This year, despite an assassination attempt against him in August, Maduro came to the UN. His speech laid out the case for Venezuela’s right to self-determination. He was able to meet the UN Secretary General Antonio Guterres and he said that his government would welcome a visit by the UN Human Rights Chief–former Chilean president Michelle Bachelet. The UN plays a contradictory role–sometimes unable to move an agenda because of the veto system in the Security Council and because of the main funders of the UN, and at other times it is able to provide genuine support to people who are in dire need of assistance (at the State of Nature blog there is a rich debate about the current relevance of the United Nations). 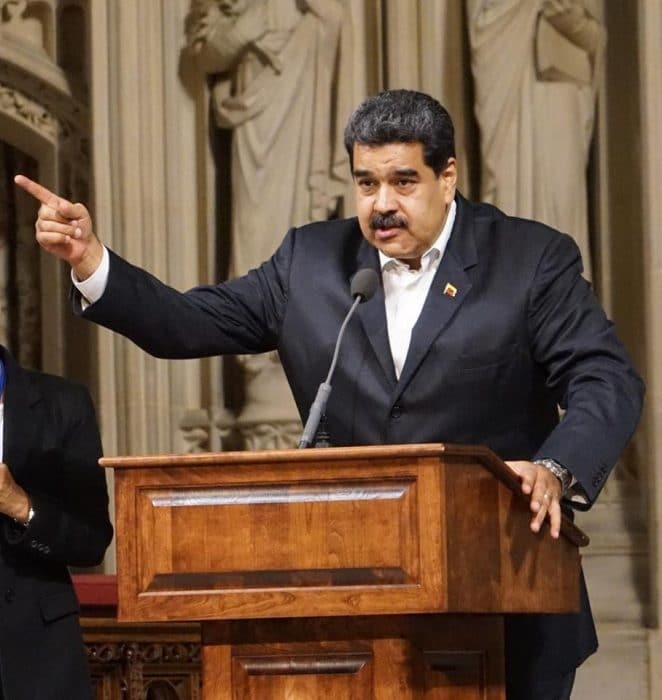 Right after he spoke at the UN, Maduro came across town to Harlem’s Riverside Church, where he joined Cuba’s new president Miguel Díaz-Canel at a gathering attended by close to three thousand people. This was a meeting devoted to solidarity with Cuba as well as to discuss Cuba’s history of concrete acts of solidarity since the 1959 revolution. Who can forget the medical brigades that came around the world to treat the poor, or the Cuban teachers who brought their literacy programmes across Latin America, or the Cuban soldiers who fought alongside the African national liberation armies? It was the Cuban assistance in Angola that precipitated the defeat of apartheid South Africa’s armies in Cuito Cunavale in 1987, the event that demoralised the South African apartheid regime. Díaz-Canel told these stories at the church–and praised these acts of concrete solidarity (my story on the event is here). What sort of concrete solidarity is in evidence today for Cuba and for Venezuela? This question bristles. It reflects the changed context in the world that people absorb the prattle from the corporate media and do not attend to the context of the attack on these countries and the contradictions within Cuban and Venezuelan society. Solidarity is essential here. Jignesh Mevani, the Member of the Gujarat Legislative Assembly, said that Modi got this award ‘despite the fact that 11 out of 12 most polluted cities in the world are in India’ and that India ranks 177 out of 193 in the Environmental Performance Index. Meanwhile, the Lancet Commission on Pollution and Health reported that India ranks no. 1 in pollution-related deaths–with 2.51 million people killed because of pollution in 2015 (that’s 25% of all deaths). That Lancet study should be talked about more often. It showed that 9 million people died prematurely in 2015–one out of every six people who died that year. That very conservative figure is fifteen times the number of people killed in war or other forms of violence. War seizes the imagination. It is brutal in a public way. Environmental poisoning is not given the focus it requires. Coughing in Delhi on a day with particularly poor air quality–which is more often than you could imagine–is a strong reminder of the fact that industrial pollution is choking all of us. So, Modi got the award for this–dirty air, terrible insensitivity to animal life with the dumping of effluents into streams and onto farmland, failure to pivot away from carbon towards renewable fuel. Solidarity is not an abstraction. Brazil has its election on October 7. The candidate who would have swept the poll in the first round–Lula–remains in prison and is barred from running for the election. Che Guevara’s daughter–Dr. 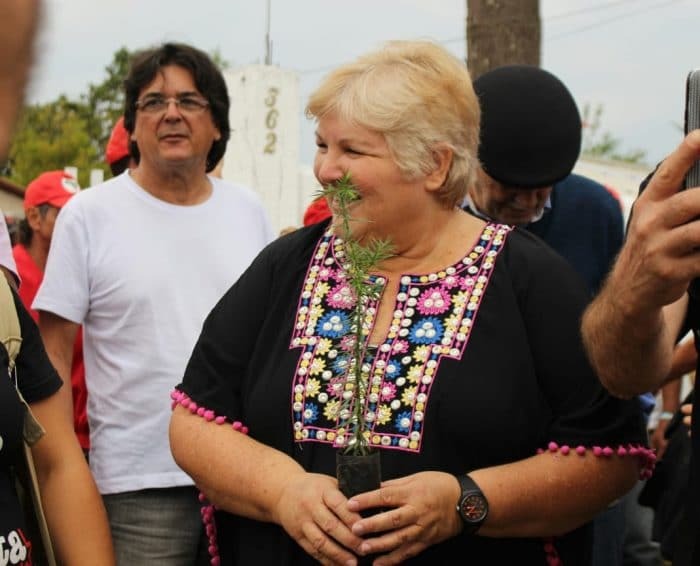 Aleida Guevara March–went to visit Lula in prison. Aleida is a doctor, one of the people who was trained in Cuba’s legendary medical schools and has spent long parts of her life on solidarity missions across the world. Outside Lula’s prison, she said, ‘No matter the cultural life or the ideology, what matters is that we are human beings and we need dignity to live, to feed our children’. We need dignity. Not only the person who is imprisoned, but also the person who has come to proffer solidarity: both need dignity. Dignity is not a gift of nature. It has to be won by conscious acts of working in solidarity with others and by fighting to make the world a better place. This is precisely what occurred in Winneba (Ghana), where 400 delegates from 62 countries gathered for the third Pan-Africanism Today conference. They came there to unite–in their bodies and in their programme–the continent of Africa and to proclaim not only that another world is possible, but that socialism is indispensable. Our Tricontinental: Institute of Social Research image of the week–below–is dedicated to Bhagat Singh (1907-1931). Bhagat Singh fought against British rule in India. For this, the British sentenced a very young Bhagat Singh to death. When he heard this verdict, Bhagat Singh said, ‘This is the highest award for patriots and I am proud that I am going to get it. They may kill me, but they cannot kill my ideas. They may crush my body, but they will not be able to crush my spirits. My ideas will haunt the British like a curse till they are forced to run away from here’. So, they did. This newsletter keeps vigil for our friend, the Bangladeshi photographer Shahidul Alam–still in jail, still without bail. It is also for the Pakistani journalist Cyril Almeida, who was arrested this week for his reports that angered the Pakistani army. It is as much for them as for the Slovakian journalist Jan Kuciak and his fiancée Martina Kusnirova, killed in Velka Maca for his stories on the government’s ties to organised crime. It is for them and for Malta’s Daphne Caruana Galizia, killed for her reports on government corruption. It is for the Reuters journalists Wa Lone and Kyaw Soe Oo who are sitting in a dungeon in Rangoon for their reports on the ethnic cleansing of the Rohingya peoples. Shahidul Alam had also covered this story. At the UN, the Secretary General António Guterres praised Bangladesh’s Prime Minister Sheikh Hasina for her country’s role in taking in the Rohingya people. He should have told her to free Shahidul Alam–and told Myanmar’s U Kyaw Tint Swe to stop the violence against the Rohingya as well as to release Wa Lone and Kyaw Soe Oo.